All kinds of fun stuff has been happening here on the homefront in the past month or so. Going through the camera roll on my phone has helped me realized that I captured much of it, but haven't shared. 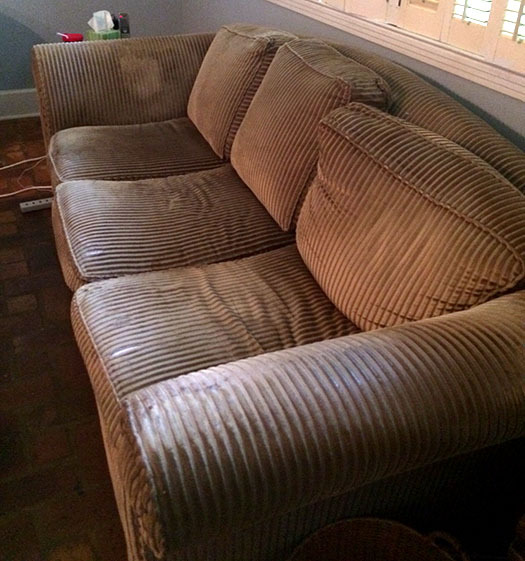 Today, let me share the saga of the new couch! When Pat and I moved into our first place, we had almost no furniture. For several weeks, we actually sat on lawn furniture before finally buying a cheap, unfinished wood futon to serve as our couch. We used the futon for a few years before we inherited a real couch. My uncle had the couch for quite a few years before we got it. So, by the time we moved into the new house last year it was well-worn. The cushions were sagging, the frame had collapsed (and was held up by 2x4s), the fabric was ripping, and there were stains all over it. 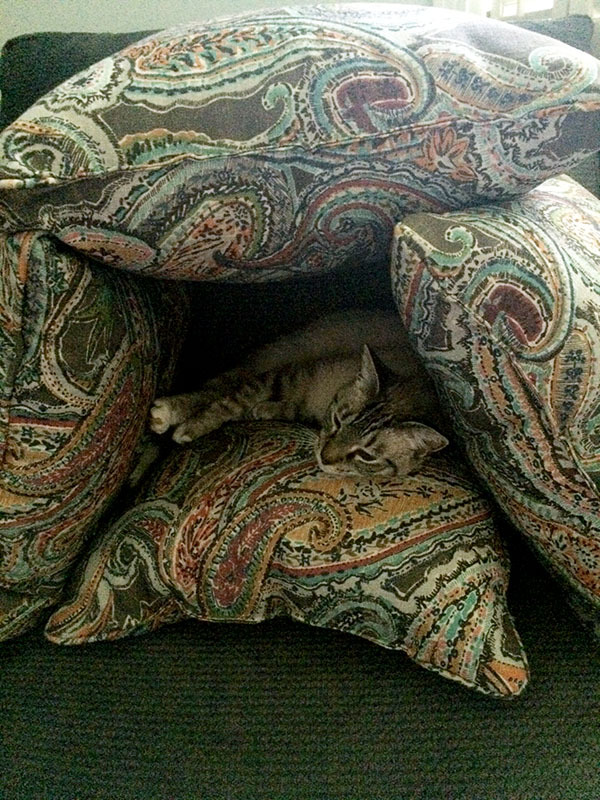 We knew it was past time for a new couch. In fact, we went shopping many, many times to look and see if anyone had something like what we wanted. After the old house finally sold, getting a new couch was at the top of our list. In all of our previous shopping trips, we had only found one couch that met our wants and needs: large sectional (so Pat and I could both stretch out), not leather, dark gray, attached back cushions, etc. Direct Furniture in Foley was our destination. The couch we wanted wasn't displayed anymore, but it was easy enough to order. J Henry Furniture makes the sofa and is based in Mississippi. Unfortunately, because the couches are made to order, it would be 6-8 weeks before our new couch was delivered. We waited on pins and needles, counting down the weeks. 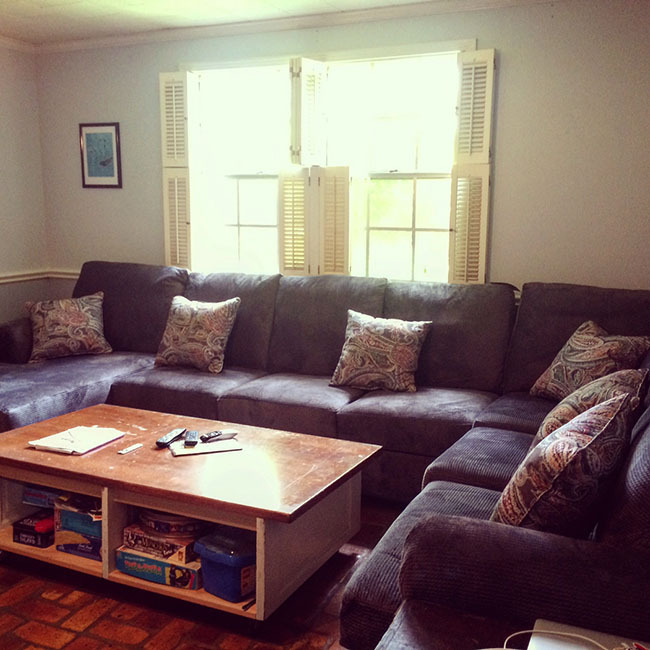 When it was ready, the delivery guys hauled out our well-loved couch before bringing in the three-part sectional sofa. Because our house is laid out oddly, we anticipated some issues but figured it wouldn't be too big a deal. We were mistaken. The first two sections went in with just a few small issues that re-positioning handled. The final section though. . .
Yup, it landed in the kitchen. Pat and the delivery guys tried everything they could to get it through the kitchen door. But, it just wouldn't go. Fortunately, there's another entrance to the living room through a storage area. 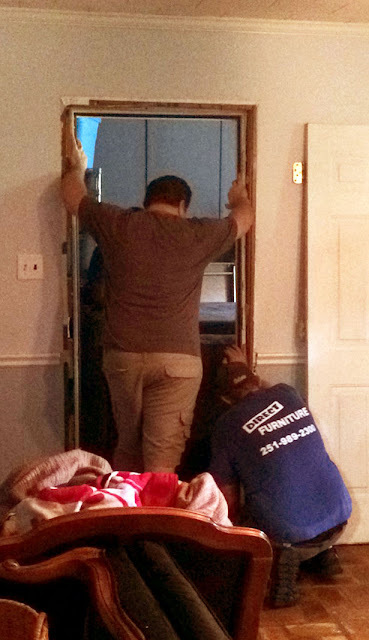 After Pat moved a ton of stuff to get the couch into that area, they realized that the couch was still to large to make it through the doorway. Off came the door and the door frame. Sigh. However, it worked. The last section was wedged through into the living room after only two hours. The delivery guys received a very generous tip! For days afterwards the door looked like this. Pat needed some supplies from the hardware store before he could replace the door and frame completely. It wasn't pretty, but totally worth it in the end to finally have this beauty of a beast. Oh, and in addition to picking out the color of the sectional, we were able to select the fabric (from an array of choices) for the six pillows that came with it. 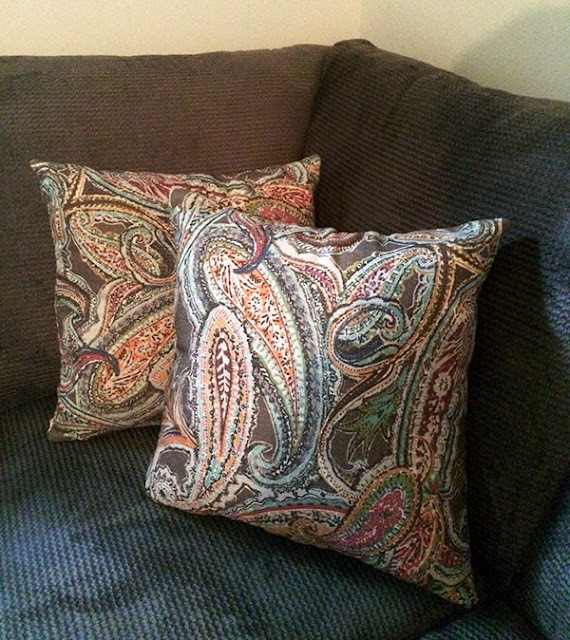 I really liked all the colors in this paisley print that we ended up choosing. It took a few hours for the cats to get used to the couch, but Asia has yet to find a spot on it that she doesn't like. So that's the tale of the couch that almost wasn't. We've had it over a month now and are still absolutely in love with it. I guess that's a good thing because it looks like it's stuck in here for a while. 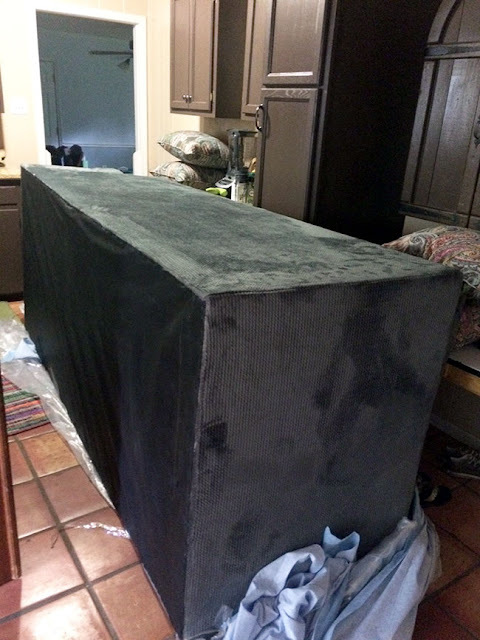 Have you ever had issues with getting large furniture moved? I'd love to know your stories. Ha! We almost had the same situation recently. When the new one came in, the old one was sent to the sitting area of our bedroom, but there was no way to get it in there! 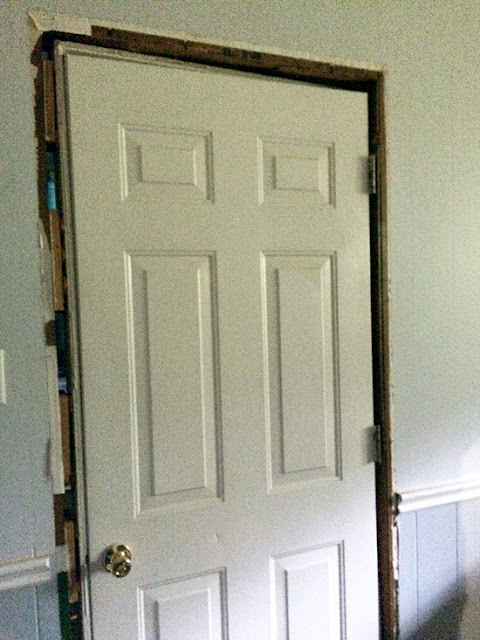 What are builders thinking when they make twisty-turny doors and walls where you can't fit furniture in the room! So glad you found a solution. We just moved the old sofa into the office. Not my first choice! A doll house is much easier to arrange, isn't it?!!! Leslie Anne, I knew I wasn't the only one who has had issues with moving furniture in. And yes, what are builders thinking? Of course, my house is an older one that's been added on to and enclosed and whatnot. But I had no idea it would be as big of an issue as it was. I'm glad y'all found a solution too, even if it wasn't your first choice. Thanks for taking the time to pop in.